Several trials in hardwoods, softwoods and mixedwoods have been initiated, treatment prescriptions tested and management guides published. With the adoption of Eco-system Management by the province, some portion of our forested landscapes will be managed for biodiversity as well as timber. Selection management is one tool that helps achieve these multi-objective goals. Management prescription keys were developed to identify appropriate conditions for this type of treatment to help forest managers successfully apply this treatment. 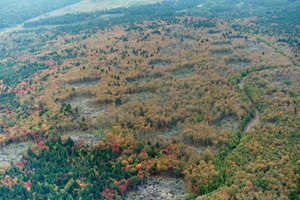 This guide prescribes silviculture based on stand and site conditions. It references the province's Forest Ecosystem Classification. The Softwood/Mixedwood guide is now available. This guide prescribes silviculture based on stand and site conditions. Big Indian Lake selection trial. E-mail for more information. Additional softwood, mixedwood and hardwood selection trials have been established in cooperation with crown and private land managers to help refine and test Selection guides. E-mail for more information on these trials. View a map of these trials.